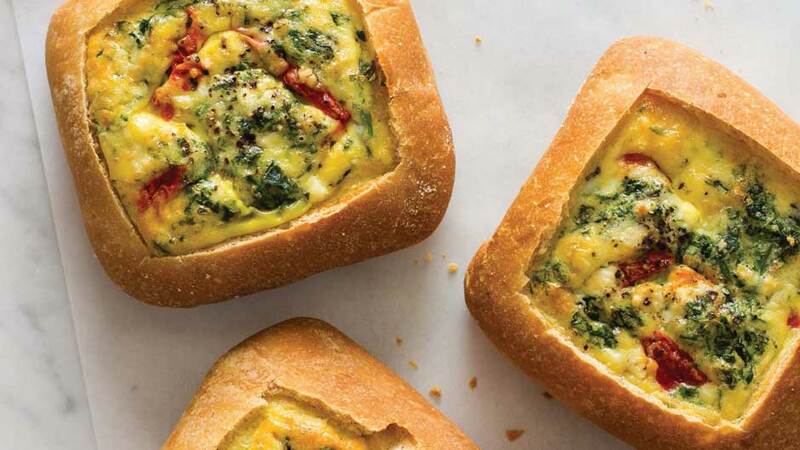 These baked egg boats were born out of our dual love for baked eggs and for soup served in a bread bowl. Why not combine the two concepts and bake a savory quiche in a hollowed-out baguette? Serve these boats for a terrific breakfast or pack one up for a midafternoon snack-on-the-go. If you cannot find square ciabatta rolls, mini baguettes—sourdough or French—will work, too. Whisk together the eggs, sour cream, onion, tomatoes, spinach, feta, salt, and pepper in a bowl, mixing well. Cut off the top 1/2 inch or so of each ciabatta roll, leaving a 1/2 – 3/4 inch perimeter around the top, then pull out most of the doughy insides. Place the rolls, hollow side up, on the prepared baking sheet. Divide the egg mixture evenly among the hollowed-out rolls. Bake for 25 to 30 minutes, until the filling is set in the center and golden brown. Let cool for about 5 minutes before serving. Cut each boat crosswise into strips to serve. Teri Lyn Fisher and Jenny Park write the popular food blog Spoon Fork Bacon, and have co-authored three cookbooks: The Perfect Egg, Tiny Food Party and Cocktails for the Four Seasons. Teri Lyn Fisher's photography covers both food and interior subject matter, as well as still life. Her work can be found in various print and online publications. Jenny Park is a food stylist and recipe developer. She has developed recipes and styled for companies including Everyday with Rachel Ray, Target, Splenda, Tastemade, and Lee KumKee.